Have you ever had a teacher that you thought had “eyes in the back of her head”? Those are often the teachers that have a strong command of their classroom and are able to effectively handle discipline in their classrooms. Like the cartoon indicates, we really do not give teachers the training and support they need in understanding what it is truly like to manage a classroom until they begin interning or doing practicums. Classroom management takes time and experience. There is nothing better than real life experience as a teacher. Two important ways to make sure you have a well managed classroom are building quality relationships and focusing your efforts on the learning. 1. More often than not good classroom management starts with quality relationships that the teacher is able to build with her students. Foundations for positive student-teacher relationships include: valuing differences, calling forth the best in students, focusing on the positive, being caring, nurturing and respectful, exhibiting genuine concern and curiosity, and maintaining a firm, neutral, assertive presence. When students feel validated it makes it easier to invite them to participate in their learning process. The best way to think about nurturing positive relationships with your students is to think about how you want adults to treat your own children. When the teacher is doing more listening than talking it is easier to help gain information about the student which allows them empowerment to lead the learning. Students need you to listen to them. Be careful when listening not to have your mind cluttered with everything else. Start by establishing a sense of community. Allowing an initial guided discussion to determine criteria for classroom agreements is a great way to allow students to feel ownership of the rules of the class. Classroom agreements should be unchanging and apply to all activities at all times. The number of agreements should be no more than five. Agreements should be phrased positively and posted conspicuously. They should be reviewed regularly. The should describe observable behaviors. Next establish procedures for the classroom. Include transition activities. Determine appropriate disciplinary actions. Help students understand the difference between discipline and punishment. Build a brain compatible classroom. Plan for upsets. Know how to handle them. Understand power struggles. And most of all don’t take bad behavior personally. Allow students to reflect on classroom behaviors as a group and connect behavior to learning. 2. Focusing on creating rich lesson plans with facilitated learning experiences helps keep students engaged. When students are engaged in your lesson there are reduced risks of behavior issues in your classroom. Product based learning also helps as students create and compose rather than consume the knowledge. After all looking at the new Bloom’s taxonomy we know that we need to strive to get students to the top of the learning pyramid where they are able to create and recreate their learning. If students are able to process learning through active engaged activities then teachers will be able to create a good flow of learning and not worry so much about discipline. Grab their attention by your activating strategy. When you are able to get students attention from the start, they want to know what’s next and engage more readily in the lesson. 3. Gifts without strings. Random Acts of Kindness. 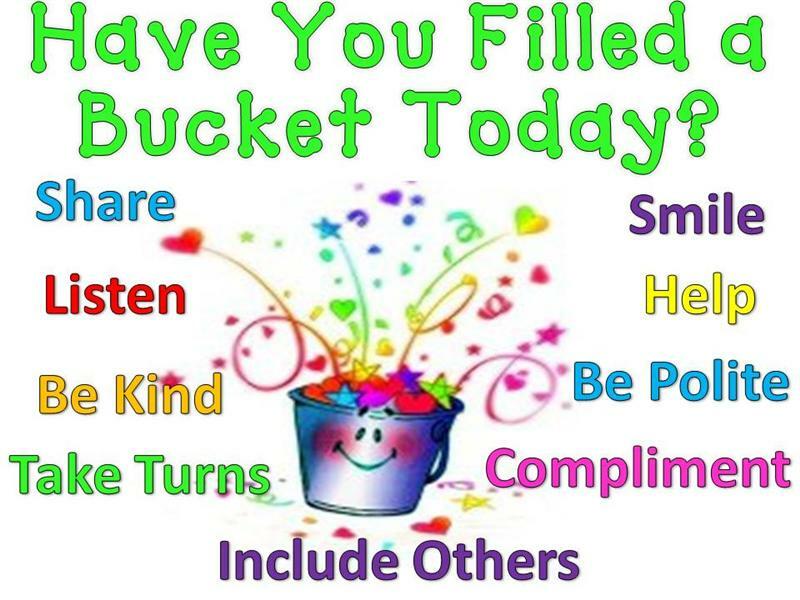 Bucket Fillers. Rachel’s Challenge. Each of these programs center around positive reinforcement that teachers and students can be involved in. Each of these programs are simple to embed in your daily classroom rituals. They are easy to do without a lot of extra work. They also provide immediate positive and concrete response to positive things happening in your classroom. Students often do not know right from wrong and often have to be rewarded with consistent feedback. Whether you use pom poms, paper chains, bucks or other concrete indicators, rewarding the positive of the greatness happening in your school catches on with your students and with your teachers reminding us all to keep it positive. 4. Target Talk. We become teachers for reasons of the heart. But many of us lose heart. How can we take heart, alone and together, so we can give heart to our students? ~ Parker Palmer, The Courage to Teach. When using targeted talk, we state specific target behaviors in precise and observable language. We place the focus on student’s competence with “You” rather than “I”. We include outcome o result words to connect values and beliefs. We include a self reflecting question to promote internalization. 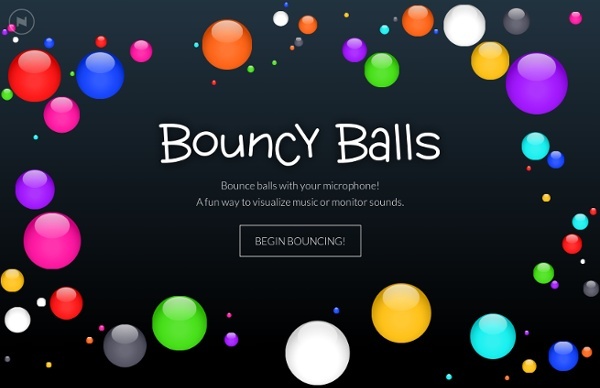 We use a neutral voice and give immediate feedback. 5. Assigned Seats. Room arrangement and determination of where students sit builds a sense of connection and relationships in the classroom, minimizes distractions, maintains more time on task, and provides equal access to teacher for all students. There are a variety of room arrangement options based on the types of tasks you are facilitating in your class. Whether putting students into small groups or strategizing to remove behavior problems to opposite sides of the room, classroom arrangement should be a thoughtful process that is revisited throughout the school year to provide fresh perspectives aligned with the learning focus. 6. Codes and Cues. Getting your students to “buy-in” to what you are “selling” is a huge piece of managing a classroom. I use American Sign Language to help my students learn another means of communication in our classroom. Students also think that this is our “private code” and they do really well following basic commands. At the very beginning of the year, I teach the sign for “silence” and for “line up”. These are commands I use daily and it works! By November I am teaching them the sign for “thank you” which makes sense because of the season. I also make up a few cues of my own for my line leader…after about three weeks he can get my class from one place in the building to another with no problem at all. He knows my required stopping points and counts to 30 in his head if I haven’t moved the line yet so he can move it for me. The majority of my students enjoy learning to sign. We even watch a video about sign language to help build in lessons on diversity. 7. Incentives. Students vote on what they want (within reason) and earn points to reach a goal to get that incentive. This year the agreed upon incentive is “Electronics Day”. When they get to 21 points they receive their award. I give and take away points, do what works for you. But remember to make the incentive meaningful to them. I have done popcorn parties, ice cream parties, movie days and more. Let the student come up with ideas and let them vote on which one works each six-nine weeks. Classroom management is the foundational strategy to help teachers maintain structure and students maintain focus in the classroom. Often it means that the teacher has to creatively manage natural socialization that is an important element of your students’ day. Building a solid foundation in the early weeks of school can pay off all year long in increased student motivation, cooperation, responsibility, and self-control. The First Six Weeks of School is a great resource to help classroom teachers lay the groundwork for a successful year. While it is written with the K-6 level in mind, it proves a valuable resource for all grade levels. The book provides detailed guidelines for: building community, creating rules and teaching routines, introducing engaging curriculum, fostering autonomy, integrating social and academic learning, and establishing high expectations for learning and behavior. Belvel, P. & Jordan, M. (2002). Rethinking classroom management: strategies for prevention, intervention, and problem solving. Thousand Oaks, CA: Corwin Press. DiGiulio, Robert, (2000). Positive Classroom Management, 2nd edition. Thousand Oaks, CA: Corwin Press. Kottler, Jeffrey A. (2002). Students who drive you crazy. Thousand Oaks, CA: Corwin Press. Marzano, R., Marzano, J., Pickering, D. (2003). Classroom management that works: research based strategies for every teacher. Alexandria, VA: ASCD. Metcalf, Linda. (1995). Counseling towards solutions. West Nyack, NY: The Center for Applied Research in Education. Rogers, Spence. (2001). Teaching Tips: 105 ways to increase motivation and learning. Evergreen, CO: Peak Learning Systems. Wong, H. & Wong, R. (2004). The first days of school: how to be an effective teacher. Mountain View, CA: Harry Wong Publications. *Also credit and special thanks to North Carolina Teacher Academy (2008) and NC Literacy Coach training which was line item budget cut by the NC Legislators when Governor Perdue came into office. Clock Partners or Buddies is meant to be a quick and easy way to create pairs for partnered activities while avoiding the problem of kids always having the SAME partners. Teachers can premake clocks and assign partners for strategic intervention. For instance, the teacher may know that a high and low student are paired at 3 o'clock. The process begins with a clock face, with slots for names extending from each hour on the dial. The basic idea is that each student has his or her own copy of a Clock Buddies sheet, with the names of 12 classmates on each hour's slot. Each of those other students, in turn, has this student's name in the matching hour slot on each of their clock sheets. How Does It Work? When the teacher needs to quickly pair up students without it always being the same partners every time, she can say to the class: "Get with your 4 o'clock buddy." Each student will pull out his or her clock buddies sheet, look at the 4 o'clock slot, and then join the partner indicated. This works because when the strategy is set up, it is done so that partners always have each other's names on their matching hour on the clock buddy chart. Simply do a google search for "clock buddies" and you will find lots of templates for this quick and easy activity. If you want a random clock partner generator look at these sites: http://clockbuddygenerator.com/ http://www.skillsconverged.com/TrainingTutorials/ClockBuddies.aspx . In this partnering up activity, the teacher places a word and its synonym on separate index cards. (If you have 26 studenst you will need 13 pairs of cards.) Students hunt the room for their match to partner up with. Words should reinforce vocabulary being taught through out the school year. This activity can also be done with antonyms. Students are given a question with multiple choice. Students are grouped according to their responses. I typically have a piece of colored construction paper placed on each of my four walls with the letters A, B, C, and D. These stay in place all year and students go to the wall where their answer is. This activity can be reused throughout the school year to sort students. Students are strategically placed in Monday's group, Tuesday's group, Wednesday's group, Thursday's group and Friday's group. Students draw from a deck of cards to be placed in random groups. Community groups are prearranged at tables by the teacher. Community groups (sometimes tribes) work towards group goals or points to achieve some sort of reward from the teacher. 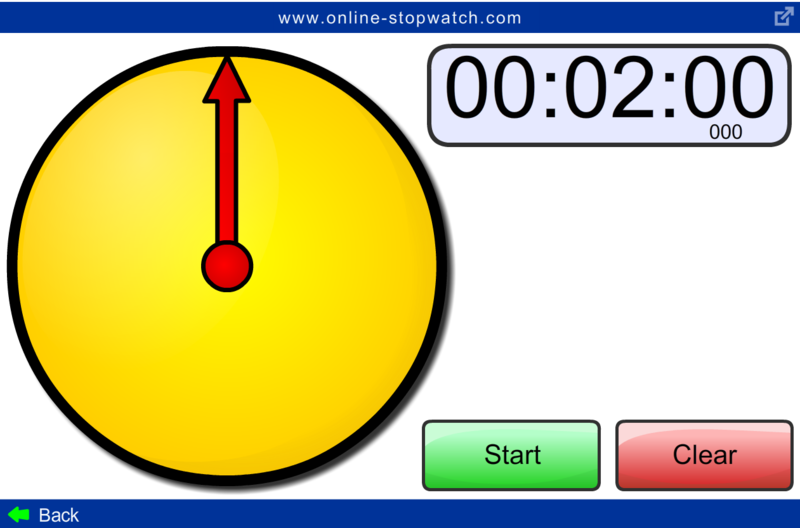 A simple egg timer or an alarm on your phone will work to help manage time for groups or activities in your classroom. Noisemakers are great tools to help as attention getters. Some examples include a cow bell, hand clappers, whistles, etc. Be sure to prep your class before the activity so they knoow what noisemaker they need to respond to. Call and responses have been around many years. Some of our favorites include: Teacher calls "3,2,1" and students respond with a clap. Another favorite for brain breaks: Teacher calls "Peanut Butter" and students respond with "Jelly Time". Another favorite for lining up: Teacher calls "Ready to Rock" and students respond "Ready to Roll"!